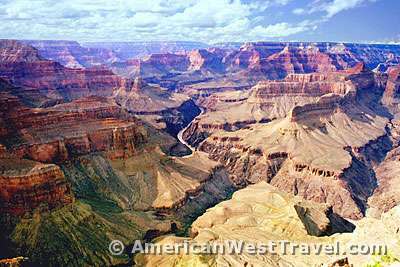 The Grand Canyon is perhaps the world’s greatest natural wonder. It offers an innumerable variety of sensations from the sublime vistas at the canyon rim to the subtle charm of the tiny creeks and streams which nourish the backcountry traveler. From the raging rapids of the mighty Colorado River to the stark desert beauty of the Tonto plateau. From 3000 foot cliffs to spring wildflowers. Bighorn sheep. Ancient artifacts. The oldest rocks (the Vishnu Schist). The shortest river (Thunder River). Stunning waterfalls. However it is not easy to fully experience this canyon. From the huge tourist crowds on the rim, the endless reservation requirements, and the physical strain of visiting the inner canyon, one must make a serious effort. 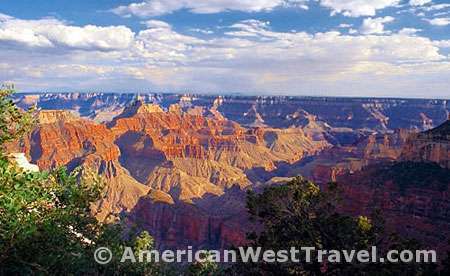 For the armchair traveler, this page offers some great vistas from the top of the canyon. Our other pages feature Hiking and Backpacking in Grand Canyon National Park and a great backpacking story, “Grand Canyon Hiking Adventure – The Kanab Creek Loop – Death March or Grand Adventure?”. A view from the canyon’s South Rim facing west. The Colorado River is clearly visible in its channel. Note that the channel is actually the “Inner Canyon” which is over 1,000 feet deep in itself! This photo was probably taken near the top of the Hermit Trail. The large side canyon entering from the left is Hermit Creek Canyon, one of the more popular (and relatively easy) access routes to the bottom of the canyon. 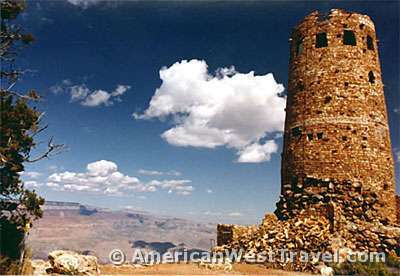 Twenty five miles east of Grand Canyon Village on the South Rim, the Watchtower overlooks the canyon and adjacent Painted Desert at Desert View. You may still climb to the viewing windows at the top of this historic structure. The vistas from Desert View are more open and desert-like. It’s easier to see the flowing river here. Also, the Tusayan Indian Ruins and Museum are just down the road. A vista of the Colorado River from Desert View makes it all seem real. At Grand Canyon Village and many other locations there are only occasional glimpses of the river in the deep and sinuous canyon. However the canyon is still thousands of feet deep here. The wall to the right of the river is many hundreds of feet high. 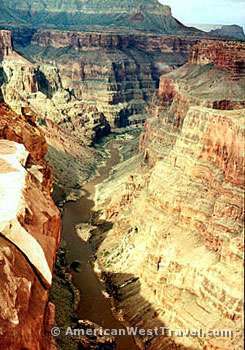 The park’s most used and famous trail, the Bright Angel, descends into the canyon from the South Rim. It is a very busy trail but it does have rest areas, tap water, and lots of patrolling rangers, making it fairly safe for novice hikers. It’s still plenty strenuous. At the edge of the plateau, the trail drops precipitously into the Inner Canyon via the “Devil’s Corkscrew”. The view from the famous Toroweap overlook in the western part of the canyon. The dropoff from the view point to the river is over 3,000 feet straight down. To get the best picture you have to get very close to the edge. Some people crawl to the edge. The Colorado River’s largest and most infamous rapids, Lava Falls, is just downstream from Toroweap. The river may be accessed here by the Lava Falls Trail. It is a very demanding route: treeless, waterless, and extremely steep. This area is always (relatively) uncrowded. Access is only by many miles of dirt roads from the main highway, Arizona 389. These roads are very scenic, and the ride to Toroweap is an adventure in itself. A view from the canyon’s North Rim. 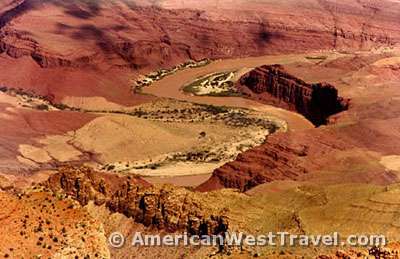 Taken from an overlook just below the Grand Canyon Lodge, the photo shows Bright Angel Canyon running south towards the Colorado River. 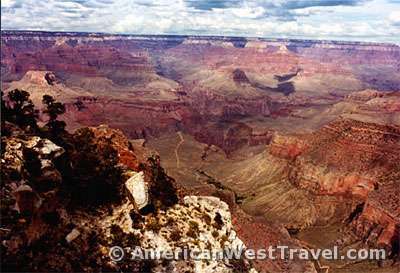 The North Rim is set back further from the main channel than the South Rim so vistas are generally of prominent side canyons. The views however are still spectacular.